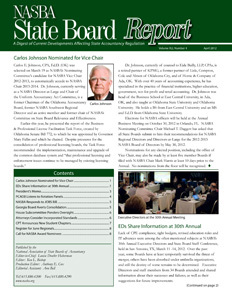 Awards Committee Chair Billy M. Atkinson has called on State Board members, executive directors, associates and staff to submit their nominations for the 2012 William H. Van Rensselaer Public Service Award, the NASBA Distinguished Service Award and the Lorraine P. Sachs Standard of Excellence Award. Award criteria and nomination forms can be found on www.nasba.org. Completed forms should be submitted to Communications Manager Cassandra Gray (cgray@nasba.org) by June 15, 2012. The William H. Van Rensselaer Award, in honor of NASBA’s first full-time executive director, recognizes a volunteer who has contributed to the development of a new or existing program for State Boards of Accountancy, or who has influenced the passage of rules or statutes to strengthen accountancy regulation. The Distinguished Service Award recognizes a volunteer for unswerving commitment and dedication to enhancing the effectiveness of State Boards. The Lorraine P. Sachs Award, in honor of NASBA Executive Vice President-Emeritus Sachs, is presented to a current State Board administrator who has done an outstanding job of improving the effectiveness of regulation. Questions should be directed to Ms. Gray at (615) 564-2172.